It's no surprise that America's Marines have some of the coolest gear in the world. And that gear makes for some of the most amazing night photography imaginable. Below, we have selected some of our favorite photos of the Corps at night that look like they could have been plucked straight from a video game. LAV-25 Light Armored Vehicles from Charlie Company fire on fixed targets as part of a combined arms engagement range during sustainment training in D'Arta Plage, Djibouti. An AV-8B Harrier with Marine Attack Squadron 311 lands on the USS Essex. 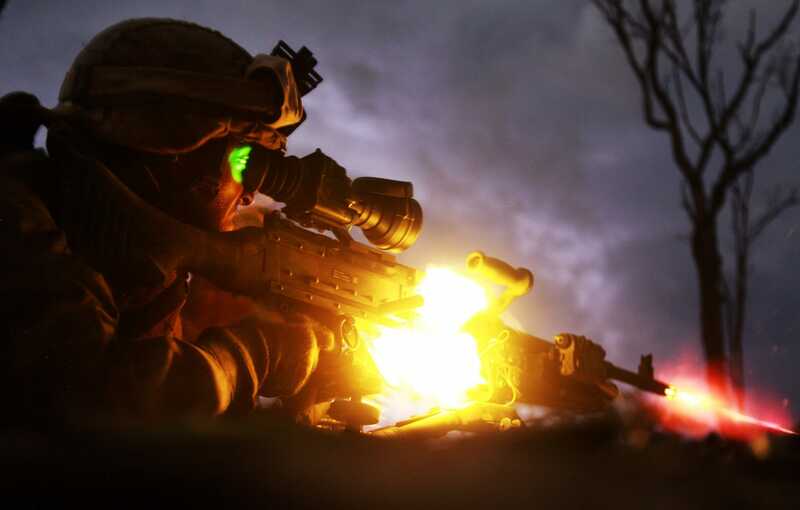 A Marine from the 13th Marine Expeditionary Unit, provides cover fire during a platoon assault exercise at Arta Range, Djibouti. Marines assigned to the 31st Marine Expeditionary Unit prepare to collect simulated enemy casualties and weapons during a mechanized raid at Shoalwater Bay Training Area, Queensland, Australia. Pfc. Sebastian Rodriguez, machine gunner, fires an M240 machine gun during a night squad-attack exercise. An MV-22 Osprey prepares for take off for night low-altitude training at Antonio Bautista Air Base in Puerto Princesa, Palawan, Republic of the Philippines. US Marines assigned to Marine Aviation Weapons and Tactics Squadron One break down a rapid ground refueling during the Weapons and Tactics Instructor Course (WTI) near 29 Palms, California. A Marine Special Operations Team member fires an AK-47 during night fire sustainment training in Helmand province, Afghanistan. An MV-22B Osprey assigned to Marine Medium Tiltrotor Squadron prepares to takeoff during flight operations aboard the USS Kearsarge. Cpl. Rashawn Poitevien engages targets downrange with an M40A5 during the Talon Exercise at Yuma Proving Grounds, Arizona. A Marine Special Operations Team member fires a M240B machine gun during night fire sustainment training in Helmand province, Afghanistan. US Marines perform maintenance checks on an AH-1Z Viper aboard the USS Anchorage.